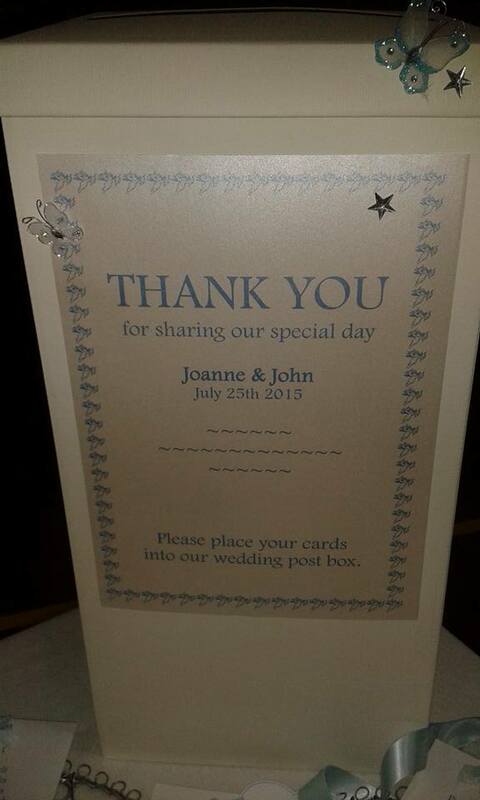 A few months ago one of the girls from Slimming world asked me to organise her wedding stationery. 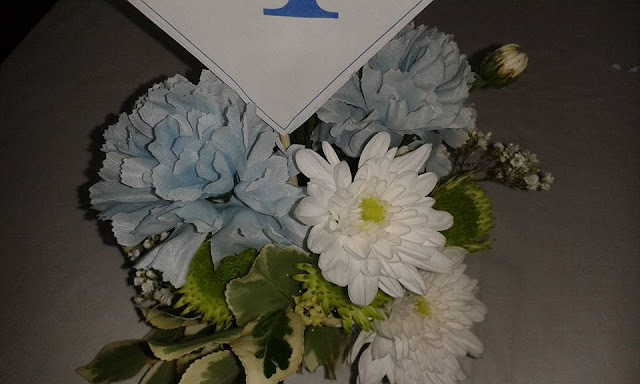 The theme was blue - to match the bridesmaid's dresses. The order was quite a big one re numbers - this is what I came up with. I added embelishments ie "Wedding Invitation" but you get the gist. RSVP's and addressed envelopes included. I know a lot of money can be made from weddings so I suggested I helped her with the reception flowers. 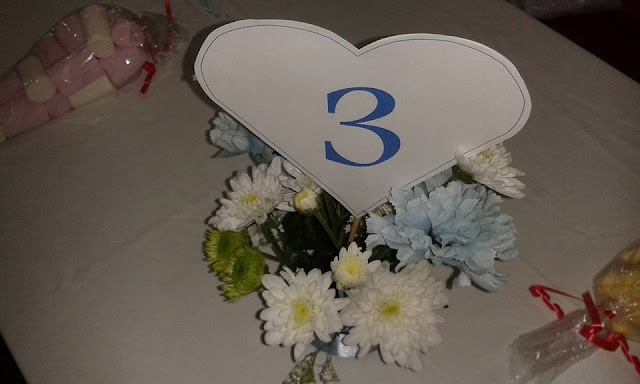 I incorporated the table numbers - there were 14 tables in all. Total spent on flowers £35. The blue carnations were artificial - but when placed amongst the real flowers it difficult to tell them apart. 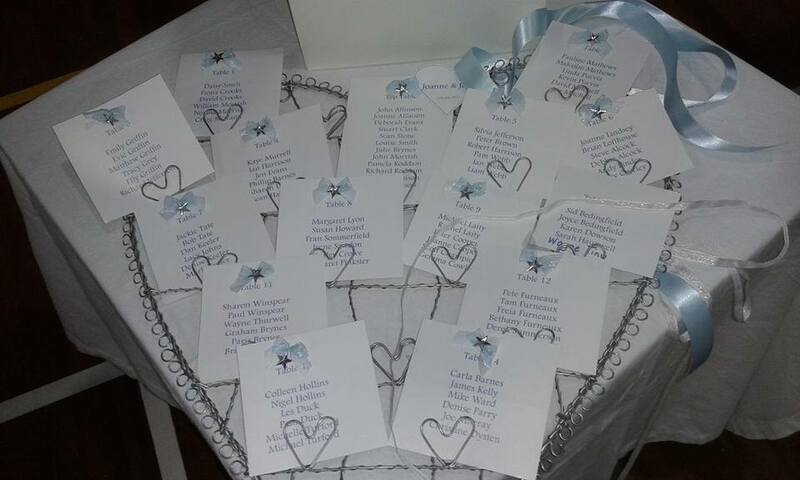 The seating plan - individual table details attached to the decorative heart I keep for resources - last time I used it was for our silver wedding celebration back in 2013. I had a few bits and bobs floating about which I added to the postbox. As Joanne and John had been living together for a while they really had everything they needed - so contributions towards a honeymoon were requested. I enjoyed creating the invitations etc. 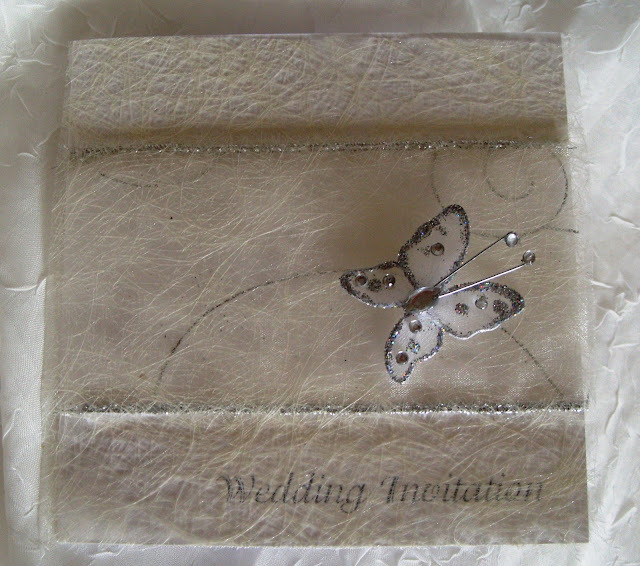 and one of the guests has made an appointment regarding her own wedding stationery etc so it will be another large commission. Whilst the wedding itself is a few months away by agreeing a theme early on makes the job more manageable, The seating plan is always the last thing I do as changes can take place right up to the last minute. I find it quite rude of people to leave the bride and groom hanging on before they let them know if they are attending, this is why I use a design that is easily managed. 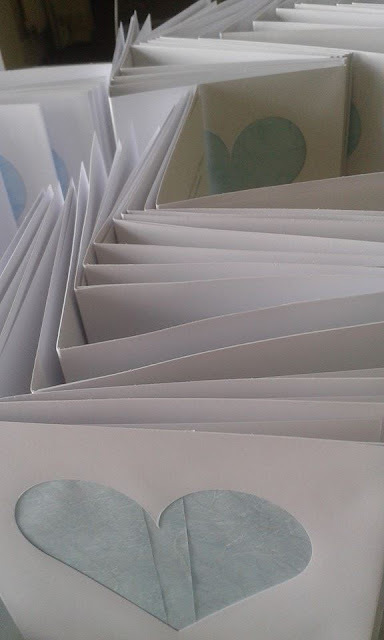 I have also been busy with a lady's 90th birthday invitations. 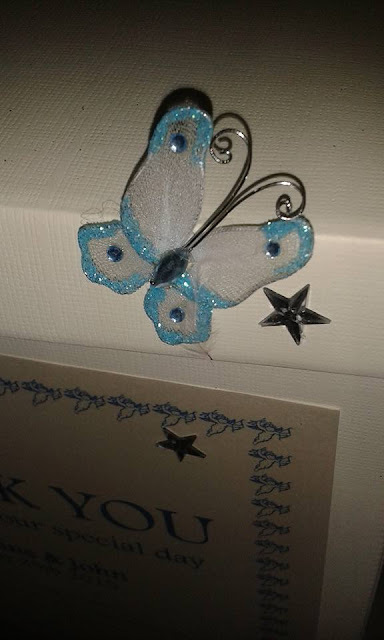 20 in all, but she wanted something special - she loved the butterfly idea I often use. Needless to say we didn't include "Wedding Invitation" - just leaving the front blank. The customer loved the invitations which is all that matters. 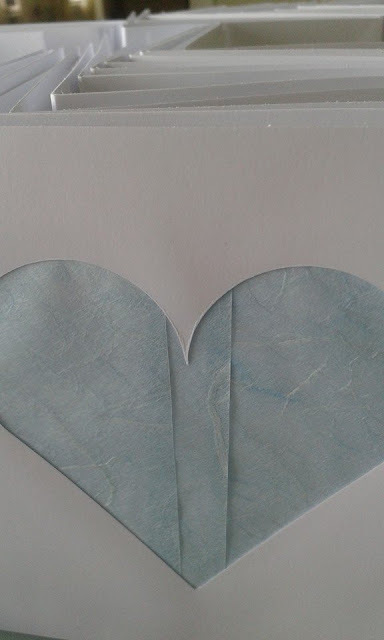 Whenever I do a wedding commission I order extra materials - which tend to mount up so once in a while I have a good clear out and pass the surplus materials over to people I know - an effort to cut down on clutter! ABC Wednesday - Catching up and clutter issues! 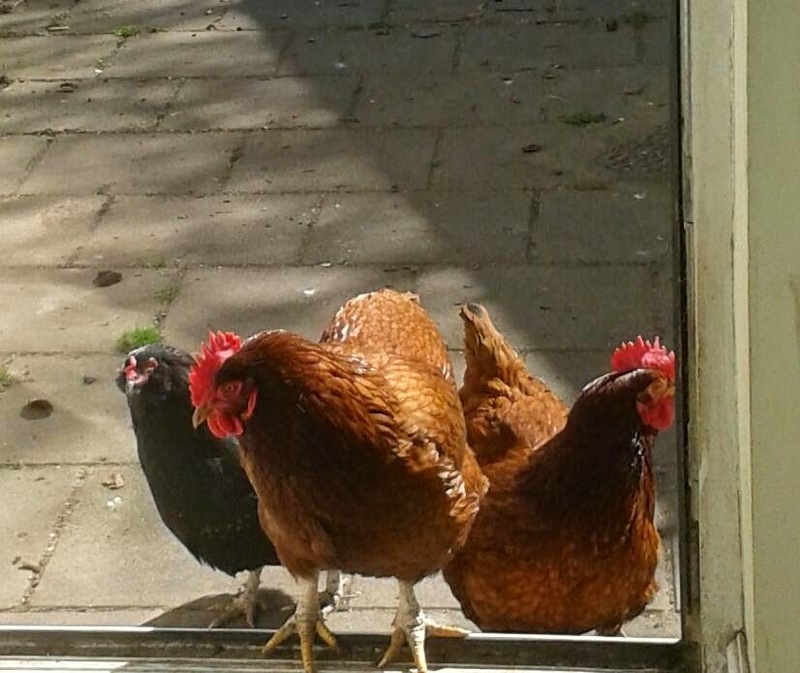 Our hens love the company of humans - this photo was only taken a couple of weeks ago, sadly we have lost Olwyn, pictured here on the right. As you will recall we lost Eva a short while ago which I wrote about here and then there was the attack on Bev, which I wrote about here. We had no idea what had attacked the hens but to our horror we found out on Sunday evening. We were sitting in the lounge when through the window as quick as a flash we saw a movement in the garden. Bev scattered away but Olwyn fell victim to next door's dog. We flew outside - the dog disappeared as quickly as he had arrived - through a gap in the metal fencing between the two properties. It had all proved too much for Olwyn who had staggered behind the greenhouse, but as Jon picked her up she died in his arms. Hens often die of shock and whilst her suffering was short it proved too much for her. The very awkward matter however is we had to speak to our neighbour - Robbie, who I have known from when he was 12. We are very close and ironically I let their dogs out for a run whilst Robbie and Emma his partner are at work. Emma looks after my hens when we go away. We went round and spoke to Robbie (Emma was away.) I left Jon with Robbie, investigating their fence, returning home to ensure Bev and Mabel were okay. As it happens they were fine. I ushered them into their shed and dealt with Olwyn. Of course I blamed myself for not getting the hens in sooner - but it was a nice night and they do enjoy a wander round the garden pond at that time, catching any flies hovering above the water. Yesterday morning on his way to work Robbie called round. He was noticeably upset and said how badly he felt about everything. He offered to buy me some more hens but I explained our 2 Bev and Olwyn are 5 and any new hens would be a major issue and would be best just left together. Allowing our hens to be totally free range has it's drawbacks - but we wouldn't have it any other way. Robbie has fixed the fence and we all carry on as normal. Olwyn did have a limp but managed to live as normal - always keeping up with the others. Bev and Mabel developed a close bond when they both had their broody moment a few years ago, which I wrote about here so they will be just fine together. So now we know what has been attacking our hens - it was right under our noses and we didn't suspect it for one minute. Life is getting back to normal here in the Nesbitt household. B - Bev and pals ABC Wednesday. We returnrd from our holiday on June 14th and I have no idea where the time has gone. What with the business, coffee mornings and wedding/birthday commissions I don't seem to have had a minute! Anyway I am back now and catching up!